Remove two target artifacts from the game. 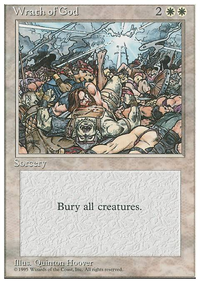 Cuts: Costly Plunder, Cower in Fear, Disenchant, Lapse of Certainty, Angelic Purge, Chainer's Edict, Choking Sands, Duress, Dust to Dust, Hymn to Tourach, Nausea, Rancid Earth, Shrivel, Soul Reap, Unearth, Armillary Sphere, Commander's Sphere, Darksteel Ingot, Orzhov Cluestone, Wayfarer's Bauble, Alloy Myr, Pilgrim's Eye, Ash Barrens, 3x Swamp. 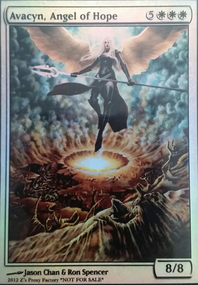 Adds: Forsake the Worldly, Palace Sentinels, Eyeblight's Ending, Merciless Resolve, Murder, Pestilence, Rend Flesh, Sign in Blood, Drifting Meadow, Forsaken Sanctuary, Orzhov Guildgate, Path of Ancestry, Polluted Mire, Evolving Wilds, Gold Myr, Guardian Idol, Prismatic Lens, Ethereal Armor, Auramancer, Monk Idealist, Eland Umbra. I wanted Ashes to Ashes and Dust to Dust in eternal masters and iconic masters. Still waiting on those. Additional deck tips for piloting! Note: Glint Hawk can do all the things Kor Skyfisher does except only with artifacts. Leverage the size of you creatures to both attack into their creatures and hold them back on defense. Trading two of their creatures for one of yours that has a Bonesplitter on it will net you card advantage in the long run which will put you ahead. If the ground is filling up, try to have the last flier standing. Regardless of how wide their ground force is, if you have profitable blocks and a Glint Hawk or Auriok Sunchaser left you'll be able to wear them down. You'll never beat an aggro deck on turn 4, don't be afraid to keep a slower hand if you have some draw power like Kor Skyfisher + Thraben Inspector . Mulligan more aggressively for fast hands. Control players are the ones you can kill on turn 4. Often a six-card hand with a one drop + Bonesplitter is better than a slow seven-card hand. Take note of how they plan to slow you down. Black decks filled with removal spells are best beaten by flooding the board and gaining card advantage with Kor Skyfisher because you'll eventually have more threats than they will have removal spells. Alternatively, if they plan to fog you into oblivion with Moment's Peace you'll need speed above all else and damage will be all that matters. Against combo players it's good to note that they won't risk losing important combo pieces in blocks, especiall if they know that you have Tooth of Chiss-Goria in your deck. As a basic rule I will side out the Scale of Chiss-Goria first followed by 1x Flayer Husk, 1x Tooth of Chiss-Goria, and 1x Frogmite in that order. Although taking these cards out subtracts form the explosive potential of the deck in the early turns, they quickly get worse as the game progresses to a greater degree than most of the other cards in the deck. Celestial Flare comes in against any deck that wants to win with one giant creature like a Slippery Bogle of an Ulamog's Crusher. It's good to know that if they attack with a tiny creature to try and protect their big threat, you can eat the small creature then play Celestial Flare at the end-of-combat step. 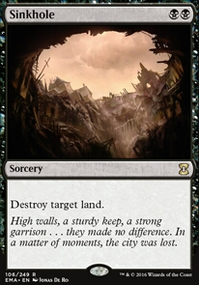 Dust to Dust comes in against affinity primarily because Dust to Dust turns into a double Stone Rain against artifact lands. This is probably the weakest card in the sideboard since the printing of fragmentize, I would suggest to cut this first when adding cards that better fit your local metagame. Fragmentize is for any decks that play artifacts and enchantments. Can be very strong when used to blow up artifact lands and is incredibly efficient at one mana. I find myself boarding in all four if they have 10+ possible targets in my opponents deck. Holy Light comes in against elves and delver, and basically any deck that plays lots of non-white 1/1's. Note: Holy Light will also hit your own germs and Vault Skirges. Lone Missionary is primarily for burn, but you could bring in one or two against other aggro decks because gaining four to eight life can sometimes put you over the top. Sunlance is the only removal spell in the 75 and gets brought in against decks that play creatures it can hit. Prized due to its efficiency at one mana, being able to both play a creature and a Sunlance in one turn can easily swing a game. Note: The third Lone Missionary could be replaced with another Sunlance against creature heavy metagames or a Mana Tithe if combo is prevalent. All things I know, thank you--other than Leave / Chance. Good idea! So far card-draw is not so bad. Having a high average CMC due to the (intentionally underpowered) theme helps slightly! Wheel of Fortune has skyrocketed in the last few months so I think the one I have will be the last :/ Wheel of Fate, while not expensive expensive is still more than I'd like to spend on a single card for one of my tertiary and intentionally-budgeted decks. My FLGS is usually cleaned out of Return to Dusts and I have several Dust to Dusts so it's that and the budget concerns keeping it out. I'm well aware it's better! Many of my other decks have it. Perhaps with it's reprint in Commander 2017 there are more... I should stock up! I would also recommend Boros Charm and Leave / Chance because Wrath of God type effects are RW's mortal enemy. With a heavy Equipment theme you aren't going to have much room for utility. A such, all non-card-draw utility cards should probably be removal. I would include at least two board wipes (more is often better, depends on your meta). Blasphemous Act and maybe Rout are good budget options. Vandalblast is sick. I'm super big on enchantment removal so Return to Dust is S-tier outstanding. Not super budget but not expensive either. I like Ray of Distortion a lot. It's very mana-intensive but the fact that you can do it twice is awesome in EDH. Dust to Dust will be handy. 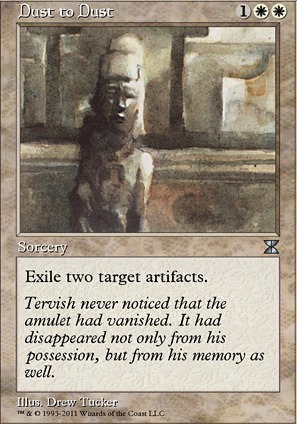 Lots of artifacts in EDH. I kind of like Revoke Existence since artifact recursion is common. Chained to the Rocks, Oblivion Ring, and Banishing Light are versatile on a budget--as are the other cards with similar effects. White is really good at shutting down commanders with things like Darksteel Mutation, Prison Term, Arrest, Pacifism, Faith's Fetters, etc. There is also Crib Swap, Swords to Plowshares, and Path to Exile--budget willing. Chaos Warp is good in EDH. Very versatile. There is lots of random utility to find out there. Reconnaissance and Dolmen Gate are usually great for aggro decks but your commander makes it far less necessary. Perhaps Brave the Sands and Always Watching . Fervor and Hammer of Purphoros are sick too. Ogre Battledriver is nice but not a samurai. Boros Charm, Make a Stand, and Rootborn Defenses can save your board state. Really, at this point the sky's the limit. You could do random stuff like Throne of the God-Pharaoh or Gift of Immortality. Forgot to mention Mask of Memory when discussing card draw and equipment. Slate of Ancestry would be good in your deck. Aftershock - Oh, so flexible. Puzzles me how this is not a mono- staple. 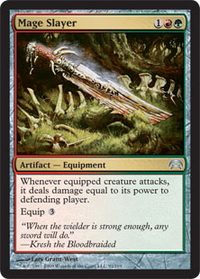 Rack and Ruin - Same goes for this card. With the amount of Artifacts in the game this will never be a dead card. Dust to Dust - What can i say? I just love the cycle. Peace and Quiet - A little more conditional as the artifact iterations, yet still super cheap for its effect. Ashes to Ashes - Doesn't hit Artifact Creatures, other than that: brutal. Wicked Pact - Not as great as the above card, but i've seen it do great things as a filler card in new brews. Repopulate - Instant speed gy hate for decks that don't have access to , don't want to loose the element of surprise by running artifact solutions. Plus, it has cycling. Love it! 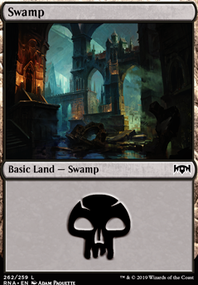 Bubbling Muck - Sorcery speed High Tide for mono- decks or decks that can get Urborg, Tomb of Yawgmoth on the board reliably. Dauthi Embrace - Unblockable2 plus insane political potential! Soothsaying - Might not be a hidden gem exactly, still an awesome mana sync. Erratic Portal - With so many people joking about EDH basically being ETB by now, this is easily abusable and somewhat political at times, too. Deglamer/Unravel the Aether - Not as old as the above, yet heavily underplayed, as they can deal with the original gods and so many other things like Darksteel Forge. Total pet cards of mine! Sudden Death - An instant speed creature removal that ignores indestuctible, get's rid of the vast majority or creatures in the format and hoses Breya, Etherium Shaper before activation. Just look at it! 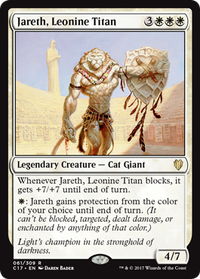 Maybe a Leonin Abunas to protect your equipment. 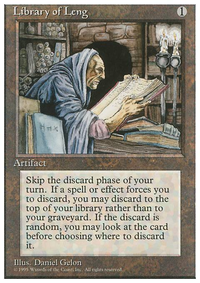 Dust to Dust is also some great removal not hard on the pocket book, same as Swords to Plowshares.